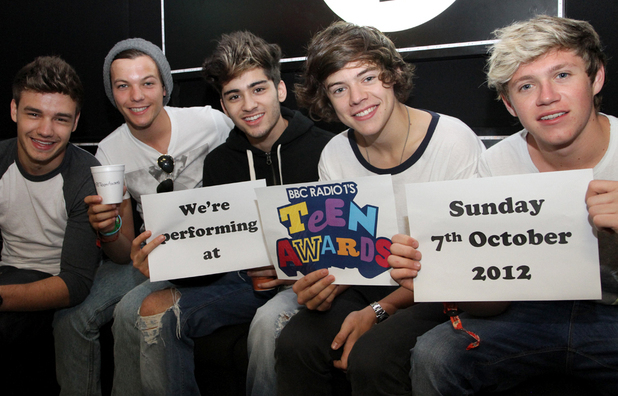 One Direction will take part in a BBC Radio 1 station takeover on Saturday, October 6. New Radio 1 breakfast show host Nick Grimshaw confirmed that the boyband’s five members will each present their own show with an established Radio 1 DJ to celebrate the station’s Teen Awards, which take place the following day (Sunday, October 7). Liam Payne will join Gemma Cairney between 8am and 10am, while Grimshaw will be joined by friend Harry Styles between 10am and midday, having joked that whoever ended up as his co-host would be “making my tea and going out for my lunch”. Finally, Greg James will be joined by Louis Tomlinson between 4pm and 6pm. Niall Horan, Harry Styles, Liam Payne, Zayn Malik & Louis Tomlinson are going to have to get some new shelves put up in their homes, if they keep scooping awards at the rate they currently are. The lads lifted their first Brit Award earlier this year, after ‘What Makes You Beautiful’ was named Best British Single at the 2012 at the star studded ceremony, then earlier this month they took another three – all that they had been nominated for – at the MTV Video Music Awards. Their winning streak looks set to continue and the lads have been named in the Best British Single, Best British Album and Best British Music Act categories in this year’s BBC Radio 1 Teen Awards. The ceremony will take place on Sunday 7th October at Wembley Arena in London and will be presented by Harry Styles’ pal and Radio 1 DJ Nick Grimshaw. 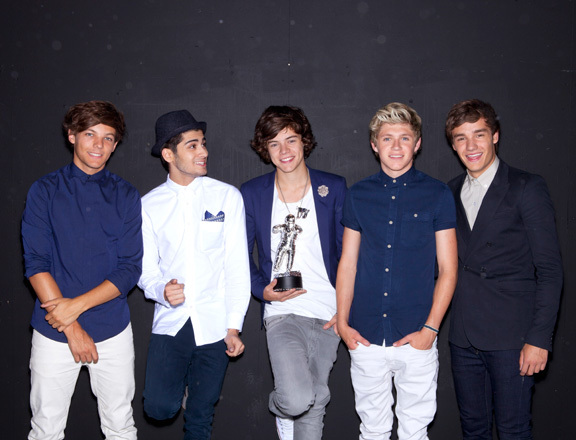 1D will be performing live at the ceremony, along with music stars such as Conor Maynard, Taylor Swift, Ne-Yo, fun. and others. Little Mix will also be taking to the stage, which means that fans may even get to glimpse a few moments of Zayn and Perrie together on the red carpet! Meanwhile, the lads have also been named as nominees in the upcoming J-14 Teen Icon Awards, as voted by J-14 Magazine readers. One Direction’s drummer has also been nominated and Josh Devine is up for the “Iconic Fan Favourite” awards. Lastly and perhaps more importantly, One Direction have also been nominated for three awards in the upcoming MTV EMAs. Unfortunately, it doesn’t look like the X Factor stars will be able to attend the ceremony, as they will be in New York, performing on NBC’s Today show, however they have still been named in the Best New Artist, Best UK/Ireland Act and Biggest Fans categories.